The mission of the Northeast Illinois Council DisAbilities Awareness Committee (CDAC) is to provide individuals with special needs the opportunity to participate in the Boy Scouts of America’s all-inclusive Scouting Program. -Raise awareness to our Units and thereby create opportunities for inclusion of individuals with special needs. -Provide support, resources, and education to Scouts, parents, and leaders. The DisAbilities Committee has transformed from a small group of hardworking volunteers into three District Disabilities Awareness committees. They are taking on new Scouts with DisAbilities from North Suburban Special Education District, and have also developed a partnership with KGH Consultants who work with youth with autism. They are also currently designing training programs for Scouters, Scouting parents, teachers, and parents in the community who would benefit from knowing about our DisAbilities program. They continue to build the DisAbilities Awareness program through an active presence and Council and District events and programs. If you have questions about special needs in our Council or in your District, contact your leadership using the links below. Aptakisic District DisAbilities Chair Vacant Interested in this role? Contact us. We believe that all Scouts need to have the greatest opportunity for participation, inclusion, and advancement in Scouting. Our program for Scouts with disAbilities is directed at helping unit leaders, Scouts, and parents develop awareness and encourage the inclusion of Scouts with disAbilities. The BSA has specific accommodations designed to allow each Scout to realize their full potential. If your scout has a special need that may require them to need extra time to earn advancements or Merit Badges, it is important to register them as a “Member Beyond the Age of Eligibility” with the Council when they first register as a Scout. This allows your scout to participate in their program of choice beyond the designated age limit. To learn more about the Age of Eligibility and for a list of required documents, click here. Local Training – If you would like to schedule an interactive awareness training for your leaders, scouts, or both, please contact the DisAbilities Awareness Committee using the links above. National Training Resources – The BSA National DisAbilities Awareness Committee’s Resource Library contains extensive content, including information on advanced training, Special Needs program considerations, and more. Beep Baseball – The Northeast Illinois Council is fortunate enough to own a complete Beep Baseball set. What’s Beep Baseball? Well, it’s just like normal baseball, except Scouts wear blindfolds! Certain members of the team can see and must direct blindfolded players to help them win. 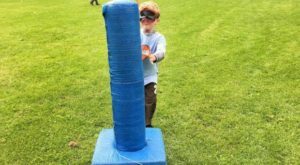 Beep Ball puts Scouts in the position of someone who is visually impaired while teaching them teamwork and concentration. To rent our Beep Baseball equipment and schedule a training, contact Betsy Uzzell. Many options are available to our special needs Scouts to assist with advancement at all levels of the Scouting program, including individualized advancement plans and substitute merit badges for the Eagle rank. To learn more about advancement and special needs, click here. Do you know a scout or adult leader who has gone above and beyond in service to Special Needs Scouting? You can nominate them for the Torch of Gold Award here.